Ten inches of snow one weekend, followed by 50-degree days and an inch of rain the next weekend- that’s winter in the Mid-Atlantic. All that precipitation is not only rough on your hair, it’s rough on your roof. So how do you know if the water dripping into your living room or the discolored patch in your ceiling means you need a new roof? 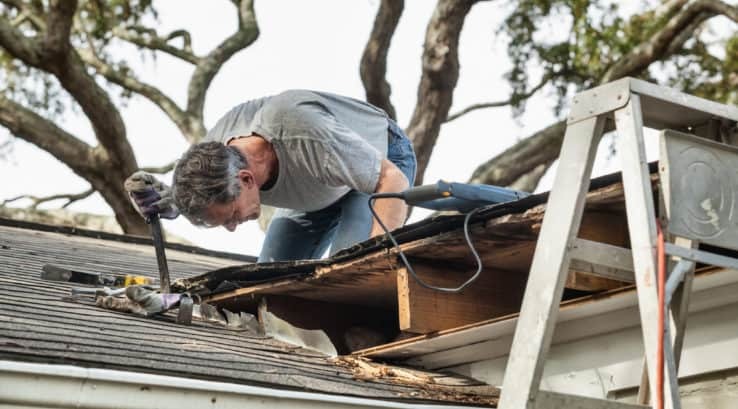 Here are some immediate things you can do when you spot a leak and some things to consider when you think you may need to replace your roof. Where there’s a drip there’s more water hiding! If water is dripping from your ceiling or bubbled behind it, place a bucket under the spot. Use a screwdriver and punch a hole in the center of the bulge. This will relieve the pressure on the rest of the ceiling and give the water a straight shot to flow out of the ceiling instead of traveling inside the ceiling damaging a larger section of it. If you can easily determine the source of the leak and can access it safely, use a tarp to cover the spot. If you know where it is but it is difficult or dangerous, call a roofing professional for emergency tarping services. Drying out the furniture or rugs that got wet from the leak is important in making sure they don’t provide the conditions for mold growth. Move wet items to well-ventilated areas or use fans to dry things out. When the weather clears, call a roofing professional to conduct a total roofing inspection to find out the status of your roof life. Leaks can be caused by missing shingles, gutter blockages and damaged flashing. There can also be failures in the seals around your roof vents, chimneys or dormers. Roof leaks caused by ice daming in gutters, failed seals or a few missing shingles can be fixed by an expert. A roofing inspection can give you a better idea of the cause of your leak and a recommended solution. Roofing leaks that extend through layers of the roofing system or failure of a roofing system due to poor installation would be better treated by a whole roof replacement which in the end will save you money. A leaky roof is not a wait-and-see problem. Left untreated, leaking roofs lead to mold, rotted framing, sheathing, destroyed insulation, higher energy bills and damaged ceilings. When it comes to repairing your roof, hiring a professional, experienced contractor is important in making sure your new roof is using top-grade materials that are installed right. At Thompson Creek you can be confident our roofing systems are installed right and installed to last. Our No Hassle Warranty is designed to safeguard your investment for up to 50 years after installation. And if you sell your home that warranty transfers to the new owners. When the weather forecast inside your home is mimicking the weather outside, don’t put off repairs for a rainy day. Call the professional roofing experts at Thompson Creek and be confident you are getting the most reliable, highly skilled and highly trained experts in the business.